Music fans have been enjoying the hits of the sixties and seventies since the Summer of Love and beyond. They get to relive those moments on the renowned Happy Together Tour 2019, which is going on its 10th consecutive year. This summer, the Happy Together Tour returns with the headline artists who delivered the biggest hits of the era: The Turtles, Chuck Negron (formerly of Three Dog Night), The Buckinghams, The Classics IV and The Cowsills. 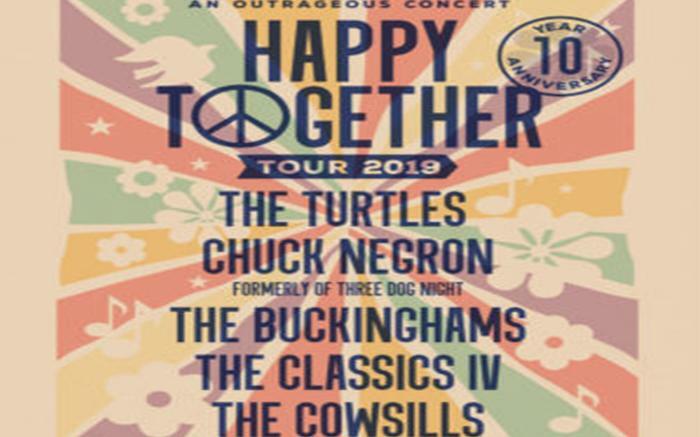 The Happy Together Tour began in 1984 with mainstays The Turtles. It started up again in 2010 with 2019 being its 10th anniversary year. The overwhelming response and love for the music have endured and The Happy Together Tour 2019 brings that magic back to fans, night after night!